RSVP and meet at 1 pm on Saturday, August 27, at the WIRT outreach table under the Farmin Park clock at the Farmers’ Market at Sandpoint, or anytime on Saturday afternoon at the WIRT Sandpoint office at 301 North First Avenue, Suite 209B, above Finan McDonald Clothing Company in Sandpoint, Idaho. We welcome assistance with creating and constructing huge, attractive banners and signs that kayaktivists, boaters, and rally participants can hoist from watercraft or the beach and that observers can see at great distances. Gather on Sunday, August 28, by 6 am for the totem pole blessing or 8 am for the kayaktivist action, in the parking lot beneath the Rosauers sign at 411 North Main Street in Moscow, Idaho. Panhandle Paddle activists could return to the Palouse region by 3 or 4 pm or later that evening, depending on carpooler arrangements. Please contact WIRT for further information about this shared travel. Several downtown Sandpoint local businesses can provide rentals of single and tandem/double kayaks, paddle boards, and boats. Please respond to WIRT with your watercraft rental intentions for the event, so we can cover some of this equipment availability and cost for participants. Can you donate toward watercraft rental fees or offer boats, gear, or supplies for this event ? Could you contribute your inspiring words and/or melodies or delicious snacks and beverages? 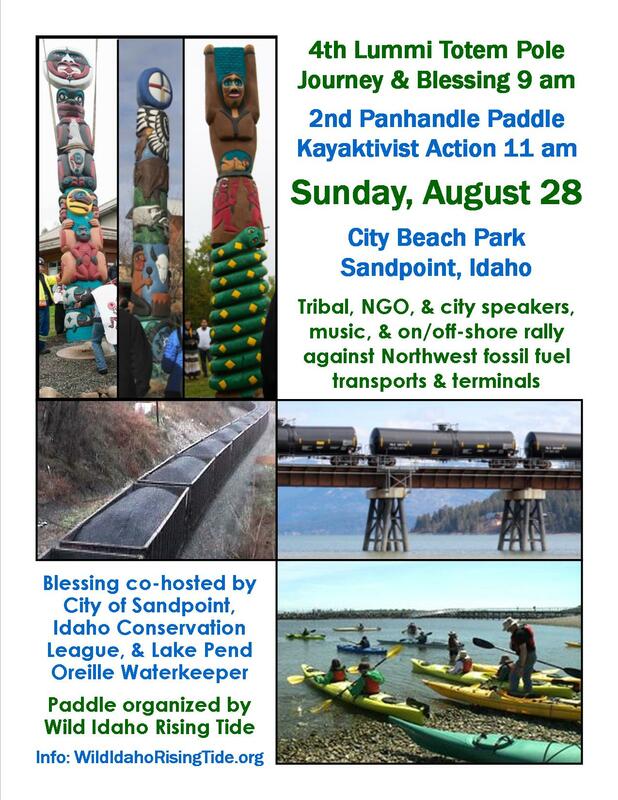 Would you drive enthusiastic Panhandle Paddle participants to Sandpoint? Can your group or organization endorse and/or co-sponsor this demonstration of people power? Please contact WIRT through any of the enclosed channels, to bolster this community event or assist with our collective expenses. Peruse the following background information about these opportunities and profusely print and post the attached, color, letter-sized Totem Poles & Kayaks Against Fossil Fuels Flyer. We eagerly anticipate sharing these experiences with you and your family, friends, neighbors, and co-workers, thankful that regional community members are actively opposing dirty energy extraction and transportation. Northwesterners have plenty to celebrate about our shared resistance to fossil fuels, as dozens of proposals for new and expanded infrastructure and transportation projects falter and fall [3-5]. Only the Millennium Bulk Terminals coal export facility proposed for Longview remains among six Powder River Basin coal ports once planned in the U.S. for Boardman, Clatskanie, and Coos Bay, Oregon, and Cherry Point, Hoquiam, and Longview, Washington. Community opposition is mounting against the last of three proposed oil-by-rail terminals on Grays Harbor in Hoquiam, against Shell’s East Gate rail expansion project on March Point near Anacortes, Washington, one of the targets of mid-May 2016 Break Free Pacific Northwest blockades and marches, and against the mammoth Tesoro Savage Vancouver Energy Distribution Terminal at the Port of Vancouver, Washington. 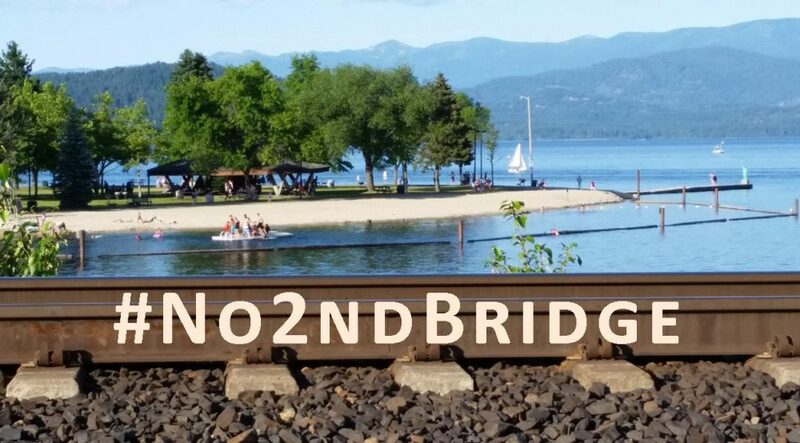 Only a few weeks after high winds during the extreme 2015 fire season scuttled the first Panhandle Paddle, Sandpoint and Spokane area community leaders and activists rejoiced at the Burlington Northern Santa Fe Railway (BNSF) announcement that the corporation would postpone its August 2014 plans to build by 2018 a second Lake Pend Oreille rail bridge 50 feet west and parallel to the original, current span . On “one of the busiest bottlenecks on Northwest rail lines,” trains now rumble about every 30 minutes on average across the existing 1905 choke-point trestle, upgraded in 2008-09 perhaps to accommodate more fossil fuels rail traffic. BNSF expected the new, similar, steel and concrete structure to relieve train traffic pressure, to reduce rail bridge and street crossing delays and blockage, and to absorb anticipated growth. But regional residents and intensive Rising Tide group demonstrations expressed concerns that another train bridge would increase railroad traffic and associated accidents that risk and pollute lives, lands, and waters. According to BNSF, declines in economic conditions and overall freight volumes, including noticeably fewer fossil fuel shipments, put second bridge construction plans on hold until commodity transport demands rebound. “On a rail bridge crossing Trestle Creek, a number of concrete supports show signs of deterioration. Trestle Creek, a tributary of Lake Pend Oreille, is best known for its superb bull trout habitat, a threatened species protected by the Endangered Species Act. Regardless, unit and mixed freight trains continue to haul oil, coal, and other hazardous materials over these aging bridges. Volatile Alberta tar sands and Bakken shale oil trains threaten explosive derailment fires with every rail bridge passage. Heavy Powder River Basin coal trains shed an average of 109 pounds of coal dust – more when their rain-soaked cars drain from bottom weep holes – directly into Lake Pend Oreille. Random WIRT train monitoring over the last year has counted two to three dozen westbound BNSF coal and oil trains per week traversing north Idaho. In the mountain lake valley that unleashed the powerful Lake Missoula glacial flood waters across the Northwest, from northern Idaho through eastern Washington to the Columbia and Willamette River basins, activists could not find a more critical industry bottleneck. In the Idaho Panhandle, all Northwest coast-bound fossil fuel trains converge and increase risks to rail line communities. Montana Rail Link and Burlington Northern Santa Fe Railway carry and spew coal along Montana and Idaho Highways 200 and the northeast shores of Lake Pend Oreille, originating in the Powder River Basin in northern Wyoming and southeastern Montana. BNSF also hauls volatile, fracked, crude oil close to U.S Highway 2 in Montana and Idaho, from the Bakken shale fields of northwestern North Dakota and northeastern Montana, to Bonners Ferry, 30 miles north of Sandpoint. Interweaving and paralleling these BNSF tracks, the Union Pacific Railroad transports equally explosive dilbit (diluted bitumen from tar sands) near U.S. Highway 95, from northern Alberta, over the continental divide (where one of these trains wrecked during winter 2015), across southeastern British Columbia into the United States near Eastport, Idaho, and south through Bonners Ferry and Sandpoint. All fossil fuel trains traveling across the four-state Northwest to expanding and emerging refineries and export facilities in British Columbia, Washington, and Oregon must file through the “Funnel,” the conjunction of these three rail lines in downtown Sandpoint and through Spokane, 75 miles to the southwest. Sandpoint, the Lake Pend Oreille and Dover rail bridges, and downtown Spokane all stand as challenging bottlenecks before dirty energy trains fan out down track, like the glacial Lake Missoula floods across the eastern Washington scablands and the Columbia River Gorge. Among the thousands of Panhandle residents who understand and denounce the dangers of extreme energy transport through cherished places, we together hold the capacity to greet every one of these coal and oil trains with resistance. Until such diligence arises, WIRT gratefully anticipates a modest, bridge-focused, land- and water-based, August 28 display of regional opposition to dirty energy corporations invading wild and rural lands and waters with their tar sands, oil, and coal exploits and subsequent climate contamination.